Godwin de Praesulibus, by Richardson. Rapin’s History. Joitin’s and Knight’s Lives of Erasmus. Burnet’s Hist, of the Reformation. Henry’s Hist. of Great Britain, &c.
For his profession in life, Mr. Waring chose the study of medicine, and proceeded a doctor in that faculty in 1767. In 1771 he appears in the list of physicians to Addenbrooke’s hospital in Cambridge; and about this time practised in the neighbouring town of St. Ives. But though he followed this pursuit with characteristicai assiduity, and attended lectures and hospitals in London, he never enjoyed extensive practice. Of this he was the less careful, as, in addition to the emoluments, which are considerable, of his professorship, he possessed a very handsome patri­' monial fortune, while his favourite science supplied him with an inexhausible fund of amusement and occupation. In 1776 he entered into a matrimonial connexion with miss Mary Oswell, sister of Mr. William Oswell, a respectable draper in Shrewsbury; and not many years afterwards retired from the university, first to a house in Shrewsbury, and at length to his own estate at Plealey, near Pontesbury. The mathematical inquiries which had occupied so large a portion of his early lite, he still continued to cultivate with undiminished diligence; and he also occasionally indulged in philosophical excursions of a more popular and intelligible class. The result of these he collected in a volume printed at Cambridge, in 1794, with the title of “An Essay on the Principles of Human Knowledge.” Under this comprehensive title are contained his opinions on a great variety of subjects. But this book, in the front of which he designates himself as fellow of the Royal Society of London, and of those of Bologna and Gottingen, was never published. 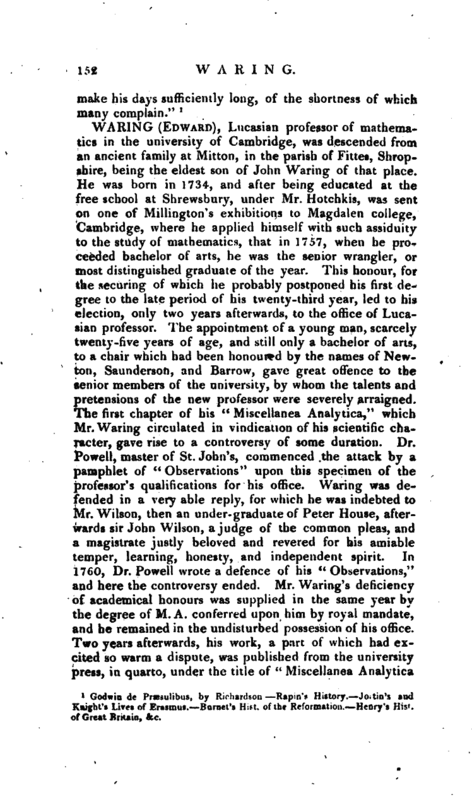 Thus passed the even tenour of Dr. Waring’s life, interrupted occasionally by a visit to the Board of Longitude, in London, of which he was a member, and from which he always returned with an encreased relish for his country retreat at Plealey: and here he might have promised himself many years of life and health, when | his career was terminated by a short illness, produced by a violent cold caught in superintending some additions which he was making to his house. He died on the 15th of August, 1798, in the sixty-fourth year of his age. 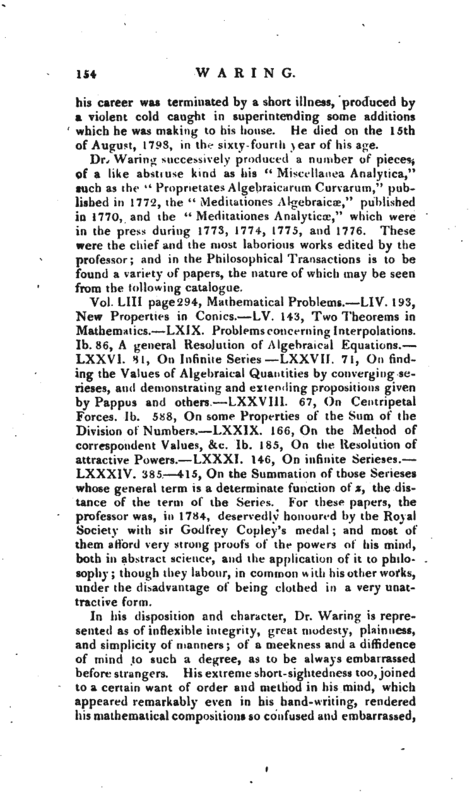 Dr. Waring successively produced a number of pieces, of a like abstruse kind as his “Miscellanea Analytica,” such as the “Proprietates Algebraicarum Curvarum,” published in 1772, the “Meditationes Algebraicae,” published in 1770, and the “Meditationes A nalyticoe,” which were in the press during 1773, 1774, 1775, and 1776. These were the chief and the most laborious works edited by the professor; and in the Philosophical Transactions is to be found a variety of papers, the nature of which may be seen from the following catalogue. Vol. LIII. page 294, Mathematical Problems. LIV. 193, New Properties in Conies, LV. 143, Two Theorems in Mathematics. LXIX. Problems concerning Interpolations. Ib. 86, A general Resolution of Algebraical Equations. LXXVI. 81, On Infinite Series. LXXVII. 71, On finding the Values of Algebraical Quantities by converging serieses, and demonstrating and extending propositions given by Pappus and others. LXXVIII. 67, On Centripetal Forces. Ib. 588, On some Properties of the Sum of the Division of Numbers. LXXIX. 166, On the Method of correspondent Values, &c. Ib. 185, On the Resolution of attractive Powers. LXXXI. 146, On infinite Serieses. LXXXIV. 385 415, On the Summation of those Serieses whose general term is a determinate function of z, the distance of the term of the Series. 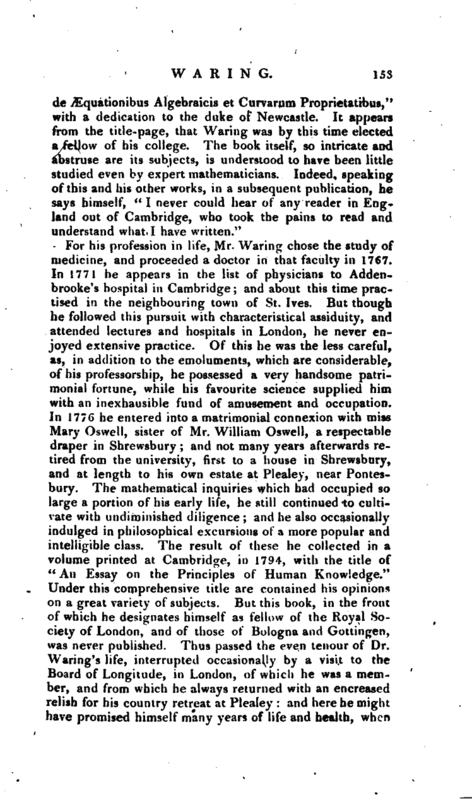 For these papers, the professor was, in 1784, deservedly honoured by the Royal Society with sir Godfrey Copley’s medal; and most of them afford very strong proofs of the powers of his mind, both in abstract science, and the application of it to philosophy; though they labour, in common with his other works, under the disadvantage of being clothed in a very unattractive form. In his disposition and character, Dr. Waring is represented as of inflexible integrity, great modesty, plainness, and simplicity of manners; of a meekness and a diffidence of rnind to such a degree, as to be always embarrassed before strangers. His extreme short-sightedness too, joined to a certain want of order and method in his mind, which appeared remarkably even in his hand-writing, rendered his mathematical compositions so confused and embarrassed, | that in manuscript they were often utterly inexplicable, a circumstance which may account for the numerous typographical errors in his publications. Account of Shrewsbury, 1810, ISmo. 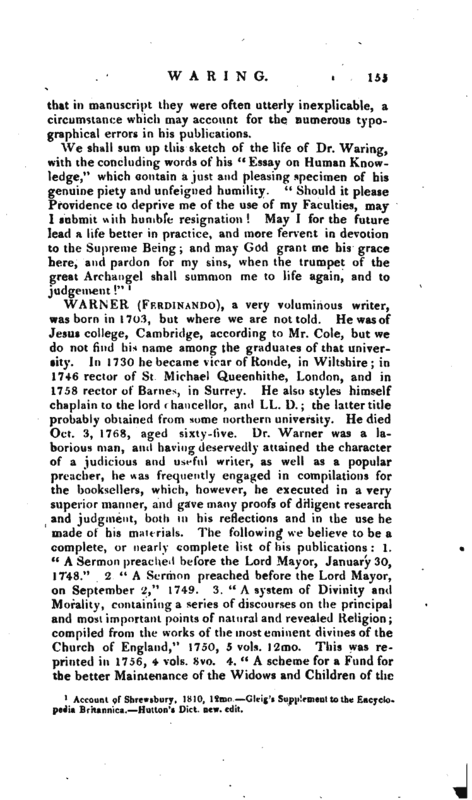 Gleig’s Supplement to the Encyclopedia Britannica. Hulton’i Dict. new. edit.